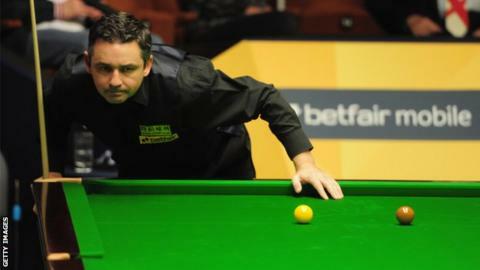 Alan McManus insists he is under no pressure going into his World Championship quarter-final, as he eyes another upset against Mark Selby. The 43-year-old, who knocked out fellow Scot Johns Higgins and Ken Doherty to reach the last eight, takes on world number three Selby on Tuesday. And he has no problem filling the role of underdog. "Mark is one of the premier players in our sport, so very few people expect me to win," said McManus. "But that's not going to make any difference to me, I'm going to go out and play my own game. I'm used to playing on that stage, albeit I haven't done it much in recent years. "There's not a lot of pressure on me and that can help. That's part of my approach this week, also to remember that I've won three matches just to get here so I've won five matches in the last couple of weeks. "I'm match sharp, so I just have to go out and perform well over the couple of days. "Mark had the big breakthrough seven or eight years ago and got to the final here, running John Higgins pretty close in the end. "He's probably on everyone's shortlist to lift the trophy here. He's got big ambitions to lift the world title, but that's not my concern. I'm going to do my best to scupper that idea, and if I perform well I can give him some trouble." McManus has twice reached the semi-finals of the World Championships, but never the final. The world number 35 is enjoying a career renaissance and puts his form at the Crucible down to his work-rate. "It's strange that in our sport you can have quite a long career if you do the right things. look after yourself and work hard, which is something I've always done," he added. "Every sports person has ups and downs but I have worked hard. In the last two or three years I've really knuckled down with my game. "But it's amazing to think come 1 June I'll have been a professional for 24 years, which is mindboggling, because I don't feel that old. The years just fly past. I feel like I've only been pro for seven or eight years, but that's just the nature of it. You've just got to make the most of it."